Rich in dietary minerals, vitamins, healthy Omega-3 fatty acids as well as antioxidants, walnuts are among the healthiest foods on the planet. Also known as Persian or English walnuts, they are thought to be a genuine superfood for the brain. Interestingly enough, walnuts are an exact replica of the human brain. One might say that this is Mother Nature’s subtle way of revealing to us the amazing properties and health benefits of this curious nut. Although eating a handful of walnuts is not going to cure your diabetes or make your IQ sky-rocket, there is evidence that regular consumption is highly beneficial for human health. Most of the health benefits of walnuts are derived from their Omega-3 fatty acids, vitamin E, copper, manganese, magnesium, iron and phosphorus content. Walnuts are an excellent source of Omega-3 fatty acids such as alpha-linoleic acid (ALA). Interestingly enough, only 4, 5 walnuts a day can provide us with the entire Omega-3 quantity required by our body in order to function properly. Omega-3 fatty acids can efficiently reduce the bad (LDL) cholesterol levels and promote cardiovascular health. Moreover, they are present within our brain and actively support overall brain function. Walnuts being extremely rich in Omega-3, it is imperative that we consume them on a regular basis because they are an essential nutrient required for healthy brain activity. EPA and DHA are two forms of Omega-3 found in generous amounts in fish and other marine life forms. 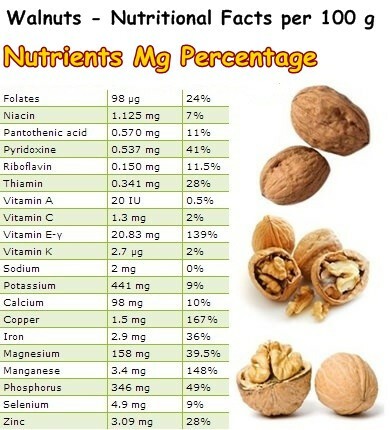 Walnuts are thus a wonderful substitute as far as Omega-3 content is concerned. To understand why it is so important to include fatty acids in our diet, think about their denomination: ‘essential fatty acids’. They are essential because they are essential for our health. A brain fed with sufficient Omega-3 is highly unlikely to develop diseases associated with old age such as severe memory loss, Azheimer’s disease, depression and even irritability. Overall, walnuts are the secret to healthy brain. No wonder they look like one. In addition to this, these funky nuts are an extremely rich source of protein. Their protein content is actually higher than that of chicken eggs: 24% of its weight. They are also a wonderful source of vitamins and minerals. 100 g of raw walnuts provide around 140% of the recommended daily intake of vitamin E and more than generous amounts of B-group vitamins. Vitamin E is the key to a beautiful, radiant skin. Thiamin (or vitamin B1), riboflavin (or vitamin B2), niacin (or vitamin B3), pantothenic acid (or vitamin B5), pyridoxine (or vitamin B6) and folate (or vitamin B9) support the efficient distribution of energy throughout the body. Walnuts are excellent sources of copper, manganese, phosphorus, calcium, iron, magnesium and zinc. Manganese is a potent antioxidant, while magnesium sustains the activity of two other important minerals: calcium and potassium. Calcium makes strong, healthy bones, while potassium regulates blood pressure and heart beat. Finally, they contain an especially potent amino acid called arginine, which plays an important role in detoxifying the body by eliminating excess ammonia forming after intense workouts. In addition to this, arginine stimulates the production of T lymphocites, one of three major types of white blood cells and helps maintain the elasticity of blood vessels. Walnuts are an excellent tonic food, highly useful in cases of malnutrition or excessive antibiotic use, not to mention they make a wonderful snack. They are a really good source of dietary fiber, which is not only a great remedy against constipation, but also contributes to colon health by reducing the time it is exposed to toxins in waste. If you are skeptical of the myriad of studies supporting the amazing health benefits of walnuts, you can look for living evidence in the people around you, as I have. I have encountered many 90-year-olds and even a few centenarians who indulge in walnuts regularly and I cannot help but wonder if that is what contributes to keeping them so healthy well into old age. Maybe walnuts are indeed a fountain of youth. Guess we just have to try for ourselves.